Hey lovelies! Whether you are a parent or not we’ve all heard about the “terrible two’s”. The tantrums, screaming, general naughtiness because they are testing out limits and learning about just how far they can push us. Well, I thought I had another 10 months to wait before we hit that horrifying stage of high pitch squeeling and throwing themselves on the floor because mommy said “No, you can’t touch the oven. It’s hot!” Unfortunately I was so so wrong. I currently have a 14 month old that is very forward for her age, I just didn’t think she was quite this forward haha! I wish someone had emphasised that the terrible two’s aren’t just for 2 year old, they are for any child that is developing an attitude! So, if you don’t have children or are expecting I thought I’d warn you of what you’ve got to come. I started to notice at about 6/7 months old Kiahs attitude was going to be very daddy with her already saying “no”, “stop it” and “go away”. Of course, for a baby to come out with such word’s we just laughed and thought about how funny it was to have a child so young tell us what to do. This is where we should have started to realise and said Hello terrible two’s, goodbye stroppy ones. We didn’t though, we were under impression that this was of course her development and not at all her stubbornness. 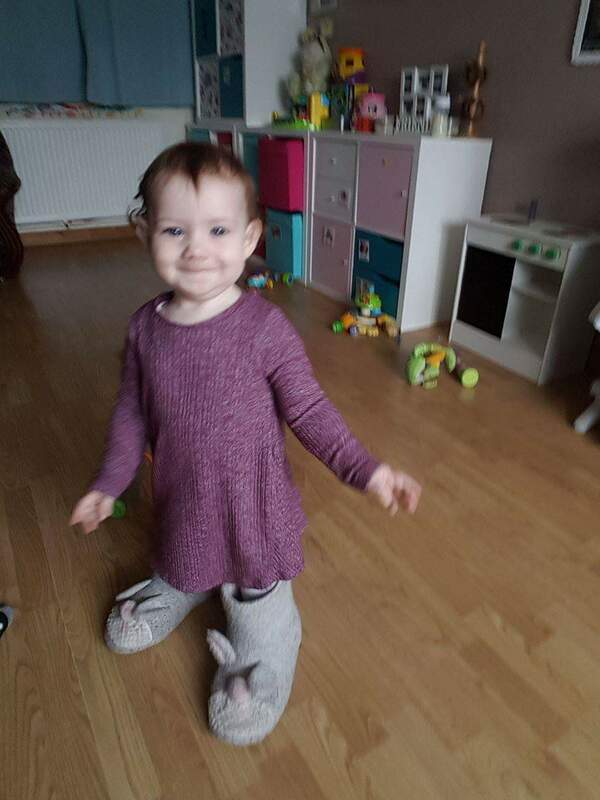 She started walking at exactly 9 months old – we were in trouble – and thought that throwing everything at her height on the floor was hilarious. It wasn’t. It became a game of Raise The Furniture. If you haven’t got to that stage yet basically, what that game is, is, gluing all furniture to the ceiling and making sure they don’t grow that tall for the rest of their lives. With having to pick everything up off the floor at least 8 times in the space of 3 minutes we decided, that our own child, was learning just how to test us before the dreaded teenage years were even a twinkle in her beautiful blue eyes. Now I’ll fast forward to a month ago, she started eating the dog biscuits (raise them up people!) which I, in turn, tried to stop immediately because it is disgusting and my dogs farts smell enough for the both of them! We then got told “no” with a pouty face and a slap to the knees. This is where I realised we were in trouble and started to pray to the lord above that she would skip the T2’s and actually be an angelic baby, that this was just a one time thing on a bad day. Oh how we were wrong. Since then every time we say no or tell her off we get screamed at and she does it any way. Oh the frustration of having to try and explain to a 14 month old “no Kiah, you can’t hit daddy there, you won’t ever get a brother or sister if you do.” Her reply to that was to hurl herself, head first into Gareth’s crotch. So, if you are expecting a child, or are even thinking about it, please keep in mind that they aren’t immune to the terrible two’s just because they aren’t two yet! I think they are something that develops as soon as their tiny, evil minds see us crack a smile when we have to tell them “no”. Other than that, parenthood is a doddle! Who am I kidding – good luck! You are going to need it! Photography courtesy of Cindy Hayden, our childminder. ← A letter to my lover.